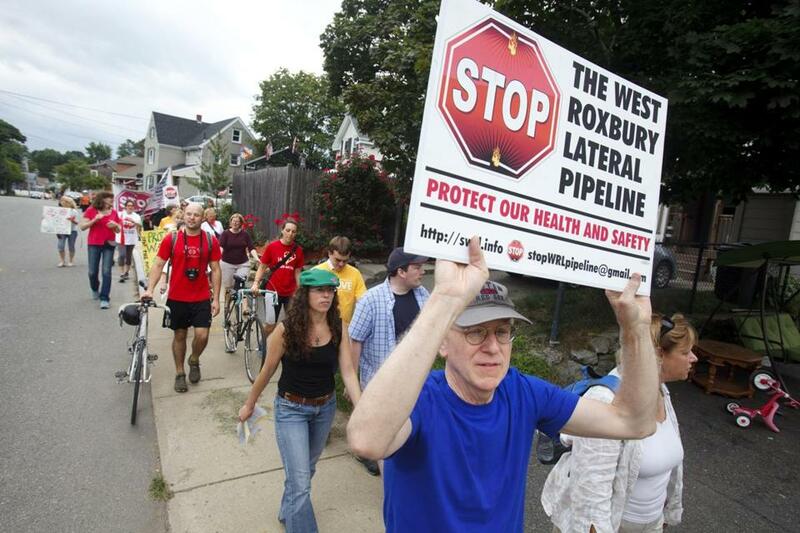 David Gallogly, of Roslindale, protested last month in Dedham against a proposed natural gas pipeline. The state’s primary importer of liquefied natural gas, contradicting a report issued by the administration of former Governor Deval Patrick, says more pipeline capacity will not help control the region’s high energy prices. GDF Suez, which runs the LNG terminal in Everett and an offshore port near Gloucester, commissioned the study to assess New England’s energy markets and the implications of using funds from electric ratepayers to build gas pipelines. The report, unsurprisingly, echoes GDF Suez’s official position: that only modest pipeline improvements are needed for the long-term stability of the region’s electricity grid. The region’s LNG supplies, the report said, along with backup turbines that use oil, can help cover shortfalls. GDF Suez, part of the French conglomerate now known as Engie, has motivation to prevent more pipelines from being built. Additional gas from lower-priced domestic sources could compete with the liquefied gas that GDF Suez delivers by ship to Massachusetts. The report, prepared by Energyzt Advisors LLC, provides new ammunition to the environmental groups that are determined to fight the pipeline subsidies being considered on Beacon Hill. Critics say the electric grid’s overseer, ISO New England, has already created a system to help ensure power plants run on cold days. Few consumer issues are as pressing to New England’s governors as the sharp rise in electric bills that constituents saw in recent winters. In large part, the increases were blamed on the region’s constrained gas pipeline capacity. Heating customers use up most of the region’s natural gas on frigid days, leaving little for the gas-fired power plants. As a result, power plant operators often elect to shut down, use backup generators with more expensive oil, or buy pricier gas imported from other countries. To combat this dynamic, New England’s governors started nearly two years ago pursuing the unprecedented concept of imposing a tariff on electric ratepayers to pay for more natural gas pipelines. The thinking was that the upfront cost would be more than offset by the savings achieved from plentiful domestic gas supplies on cold days. The Baker administration is taking a somewhat different approach now, but the end result would still be the same: Electric ratepayers would cover costs for gas pipeline construction. GDF Suez’s Energyzt report aims to blow apart the theory behind this prevailing way of thinking. The report argues that the real beneficiaries of these major pipeline projects would be companies looking to export the gas to other countries. The extra capacity would be needed only on the coldest days, the report says. Meanwhile, electric customers could end up with the tab. But Anthony Buxton, a Maine lawyer who represents a pro-pipeline group with a number of industrial members, argues that policy makers should give more credence to a report the Deval Patrick administration commissioned last year. That report said an increase of about 20 percent in New England’s pipeline capacity is needed to meet the demand in Massachusetts. Buxton also cautioned against relying too heavily on LNG over domestic sources of gas, such as the Marcellus Shale in Pennsylvania. “The availability of [imported] LNG depends almost entirely on foreign policy factors and events not in control of anybody in the United States,” Buxton said. When asked for a reaction to the Energyzt report, a spokesman for Baker’s energy office noted that the administration has recently filed bills to spur more solar panel installations and bring in more hydropower from Canada.